The term “urban mining”, which is now a well-known concept, refers to the reclamation of compounds and elements from man-made sources. When buildings are being demolished, e. g., any valuable materials encountered, such as copper pipes and cables or old lead piping, can be extracted separately and the metals reused. Concrete rubble can also be recycled to produce new aggregate and scrap brick material can be turned into plant substrate. A sub-type of urban mining is “landfill mining”. Household waste dumps have been widely used over the years and sites of this kind are to be found in practically every major residential area. In Germany alone there are an estimated 106,000 abandoned installations of this kind as well as 372 old landfill sites (based on figures obtained for 1988). Until the year 2005 the latter were in some cases also allowed to be used for the storage of organic waste. However, before old landfill sites and waste tips of this kind can be opened up again with a view to extracting the valuable materials they contain it will be necessary to carry out investigations into the biological activity of such installations. It must be assumed that most of these 100,000-plus abandoned sites will still be biologically active and will therefore contain huge quantities of reactive organic matter. Opening up a waste dump or landfill site of this kind will cause oxygen to be introduced into the system and this will in turn trigger chemical and biological reactions. This will inevitably result in the emission of gases and unpleasant odours. When combined with rainfall the outcome will be washouts and a contamination of the groundwater. This is where the first step towards landfill mining begins. This procedure also has to distinguish between waste dumps without landfill gas capture and those with landfill gas capture. New, depth-filtered gas wells are installed at the waste sites and these are then subjected to a slight degree of over-suction in order to reactivate the anaerobic organic matter. In the case of old landfill sites the existing gas wells undergo suction along with depth-zonal sampling. This operation usually identifies near-surface leaks in the gas wells that then have to be sealed up. The newly repaired and depth-filtered wells then become operational again. In the case of both abandoned waste dumps and disused landfill sites it is possible to extract sufficient quantities of landfill gas of suitable quality for energy production. It is proposed that such projects will be able to extract gas for energy production purposes for a period of ten to 20 years. Only then will it be possible to open up the aerobically inertised waste sites so that recycable material can be safely extracted without any significant impact on the environment. By then the cli-mate-relevant CH4 will have been converted into energy and burnt in the form of less-damaging CO2. Moreover, the sale of electricity and heat energy will help cover some of the costs of the operation. The term “urban mining” is now a well-known concept. It means the reclamation of compounds and elements from man-made sources. When buildings are being demolished, e. g., any valuable materials encountered, such as copper pipes and cables or old lead piping, can be extracted separately and the metals reused. Concrete rubble can also be recycled to produce new aggregate and scrap brick material can be turned into plant substrate. A sub-type of urban mining is “landfill mining”. Household waste dumps have been widely used over the years and sites of this kind are to be found in practically every major residential area. In Germany alone there are an estimated 106,000 abandoned installations of this kind (waste dumps that were officially closed prior to 1st June 1993) as well as 372 old landfill sites (as at 1988) (1). Until the year 2005 the latter were in some cases continued to be used for the storage of organic waste. It is thought that Germany’s disused waste dumps contain at least 60 bn € worth of raw materials, namely metals, minerals such as phosphate and energy-rich waste material that can be converted into highly productive landfill gas with a methane content of as much as 65 % by volume using a targeted process of bacterial degradation (2). However, before these waste dumps and landfill sites can be opened up in order to extract the useful materials they contain an assessment has to be made of the activity associated with the decomposition of any remaining organic compounds within the body of the site. The current thinking in respect of the half-life period of organic processes in waste dumps holds that the percentage of organic material is halved every six to eight years as a result of bacterial conversion (degradation). It is therefore assumed that the bio-available organic matter present within the body of the site will for the most part have been transformed after a period of 30 years or so. After this time has passed the products resulting from the conversion of organic compounds should no longer pose any risk in the form of leachate and air from the waste dump and the site can be released from supervisory control. However, the projected half-life period of just six years referred-to above has been determined under ideal conditions and will rarely apply in reality. Generally speaking, landfill bodies of this kind are too dry for biological and chemical reactions, or these reactions take place at a much slower pace, because the area concerned achieves nowhere near the optimal temperature of around 37 °C that is required for anaerobic bacteria (without oxygen). The half-life periods that apply under real conditions can therefore last several decades. As a consequence of this it must be assumed that most of the 100,000 or more waste dumps referred-to above are still biologically active at a very low level and accordingly will contain large amounts of reactive organic matter. If such a waste dump or landfill site is opened up the oxygen thereby introduced into the system will in turn trigger chemical and biological reactions. This will inevitably result in the emission of gases and unpleasant odours and in combination with rainfall could potentially lead to washouts and a contamination of the groundwater. Landfill gas is a microbiological degradation product composed mainly of solid organic components. It is made up of methane and carbon dioxide (CH4 + CO2). Under ideal circumstances it would be formulated as follows: the CH4 concentration should be about 55 % by volume or higher, the CO2 concentration would then be around 35 % by volume or lower. The remaining 10 % or so would be made up of water vapour and other gases. 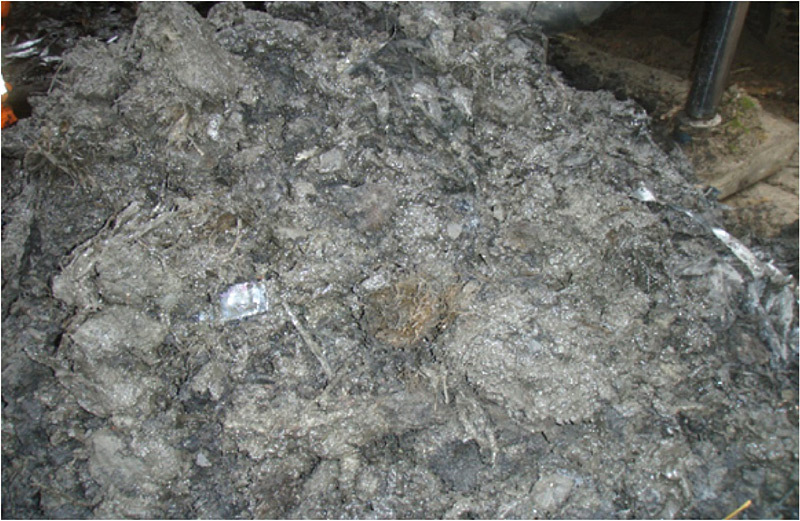 It is generally assumed that domestic waste contains between 150 and 300 kg/t of bio-available organic matter. The gas generation should therefore amount to around 150 to 300 m3/t of landfill gas. Landfill gas with a methane concentration lower than 60 to 65 % by volume is not generally formed. Of course landfill gas with lower CH4 concentration levels than this has been measured, in this case a gas containing around 40 % by volume CH4 and 25 % by volume CO2. However, this was not pure landfill gas but rather a mixture of around 40 + 25 = 65 % by volume landfill gas and 25 % by volume nitrogen making up the difference to 90 % by volume This nitrogen can only have come from the air. The gas well from which this sample was taken was found to have a leak and was drawing in ambient air. The atmospheric oxygen incorporated in it, 6 to 7 % by volume, was converted into CO2. The following relationship generally applies: the sum of the percentage figures of CH4 and CO2 subtracted from 90 gives the percentage share of atmospheric nitrogen in the gas being examined. The atmospheric nitrogen calculated in this way always comes from the outside air. However, this knowledge is usually only of limited use since in the case of gas wells with leaks of this kind it is often only the flow that is reduced. The actual leak is disregarded. In such cases much more information is obtained by taking special gas measurements and then using these data to derive a process by which leakages of this kind can be eliminated to a large degree. It is then that a very important, though generally overlooked factor comes into play. In the upper well zone the conversion of the deposited material is well advanced with gas flowpaths leading to the surface having developed as a result of organic decomposition. These flowpaths allow air from the outside environment to enter into the gas being extracted. In the deeper lying parts of the waste dump organic decomposition is less well advanced. The overlying weight tends to compact the material, the pore space is reduced and the suction pressure is insufficient to extract the gas. Leaks in the upper well zones mean that the suction pressure is reduced in these areas and the operation consequently has little impact further down into the body of the dump (Figure 1, right). Fig. 1. Suction radii applying to depth-filtered and standard gas wells. // Bild 1. 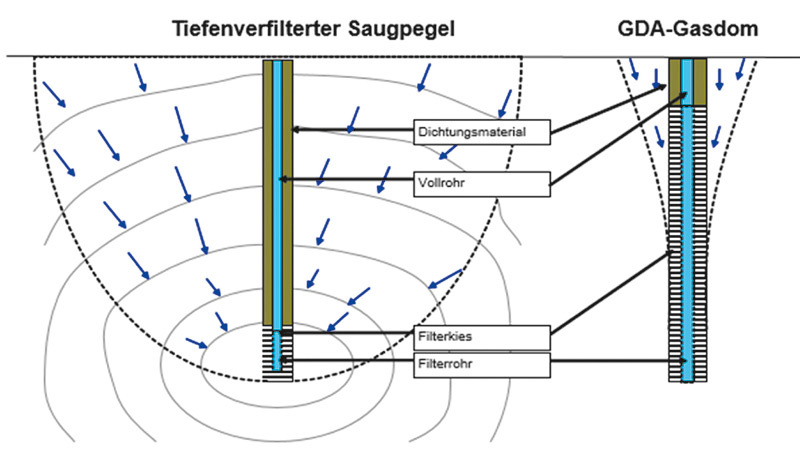 Saugradien von tiefenverfiltertem und normalem Gasbrunnen. This is not the case when it comes to depth-filtered gas wells (Figure 1, left). Because of the fairly large distance between the filter and the surface of the tip the negative pressure applied around the filter path in the gas well is able to build up inside the deposited material. The risk of a short circuit to the surface is fairly low. The extracted gas is mostly undiluted. Depth-filtered gas wells can usually only be set up as part of a new installation, although it is also possible to retrofit existing wells to achieve the same outcome (see below ‘Renovation options for leaking gas wells’). The existence of 100,000 or more abandoned waste dumps and 400 or so disused landfill sites creates two distinct problems. Many of the former waste dumps have no ground seal or leachate collection system and most of these also lack a surface sealing system and gas collection station. Dumps containing more than 500,000 m3 of material therefore merit closer examination. This would be called for when near-surface measurements have identified CH4 emissions and damage to vegetation, particularly to deeply rooted trees, suggests the presence of CH4 in the body of the landfill. Such abandoned waste dumps will pose a danger when the gas begins to migrate through the soil surrounding the body of the dump and towards local buildings, where it can enter poorly ventilated areas such as cellars. Several hundred of the country’s abandoned landfill sites are equipped with ground seals and leachate collection systems along with surface seals and gas collection stations. In this context gas collection can merely mean the existence of gas wells, an extraction plant and a gas power station. Gas extraction is often either much reduced or has stopped completely as the gas quality is no longer adequate for energy production purposes. Usually the gas will contain little CH4, a lot of CO2 and nitrogen, along with some amounts of oxygen. The site operators then anticipate that the methanogenesis process will come to an end. The waste dump in question is located in the Ruhr region. This former municipal landfill site is a dump-type installation with no surface sealing system. The site covers an area of 13 hectares and at its highest point reaches up to about 35 m above the surrounding land (80 m above sea level). The site borders an industrial area to the south and adjoins a recycling depot at its western end. A stream flows along its south-western limit and there is a disused railway track running along its southern border. The landfill site can be divided into a north-eastern and a south-western section. These zones are separated by the route of a gas pipeline. A loop road runs from the recycling depot across the north-eastern section to the highest point of the former tip. Between 1925 and 1952 there was a waste-water treatment plant operating in the area of the south-eastern section. The settling ponds were filled-in in the 1960s (3). After the installation closed local waste began to be deposited at the site in a random and irregular way and it is known that extensive dumping took place there between 1959 and 1963. From 1963 on the dump assumed ever greater dimensions until, in 1983, a halt was called to the tipping. The entire site was then covered with several layers of soil and rubble and planted with trees. Today this densely wooded area has been designated as a nature reserve. Aerial photographs taken in 2009 show that the forest site contained a high proportion of dead wood, a development that can be attributed to a disturbance of wood growth, and even a number of dead trees. These clearly recognisable growth impairments are indicative of a high build-up of landfill gas in the soil. This abandoned waste dump was most recently the subject of investigations carried out as part of four bachelor theses for the Technical University of Applied Sciences Georg Agricola (THGA) in Bochum/Germany. 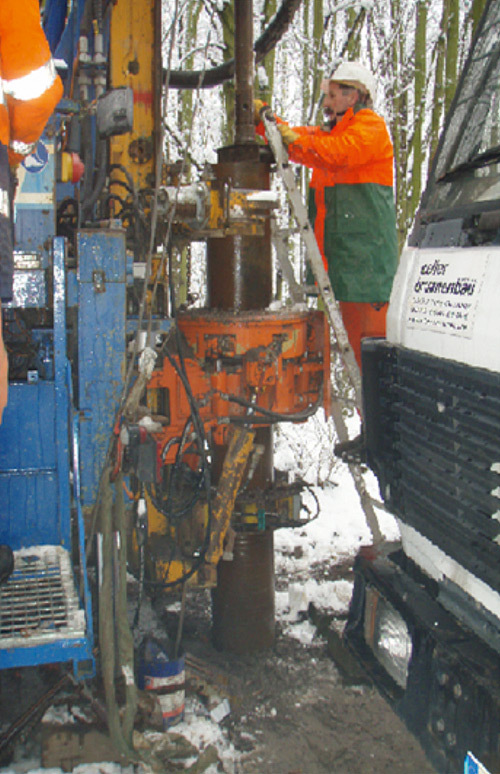 With support from Celler Brunnenbau GmbH an exploratory borehole was sunk in February 2013 and this was then lined to create a gas well (Figure 2). An examination of the drill cuttings (Figure 3) revealed an average organic content of over 15 %, this representing more than 150 kg of reactive organic matter per tonne of landfill material. Measurements taken from the lined gas well revealed a volume flow of 18 m3/h of landfill gas with more than 60 % CH4 and around 35 % CO2, and this without any suction being applied. This contradicts the current theories on organic conversion in landfill sites but it also suggests that abandoned waste dumps of this kind are a potential source of energy and shows that there is a need for action in respect of hazard prevention and environmental protection. The household waste dump at Celje in Slovenia is divided into a disused section, this dating back to the time when it was used to store untreated organic waste, and a still functioning new section that is only used for pre-treated material. The disused part of the site has no ground seal and the surface has been covered with a fine-grained soil, though this has not been sealed. There are quite a number of gas wells currently providing gas of low quality, some of it containing oxygen. The two installed generators of 1,000 and 600 kW electrical output are now only run intermittently with just a single unit ever in operation at any one time. A survey of the gas wells using an electric light gauge and borehole camera showed that some of them had been completely destroyed as a result of the settlement of the waste material. The well pipes were buckled and crushed a few metres below the surface. A number of other wells underwent a process of suction and depth-zonal investigation. This involved measuring the temperature, the CH4, CO2 and O2 concentration levels and the gas velocity every metre. This particular survey showed that the upper zones contained small quantities of CH4 and amounts of oxygen, with the gas moving at relatively high flow rates. In the deeper lying areas the flow rate was much reduced, the oxygen content was 0 % and the CH4 and CO2 concentration levels were typical for a landfill gas composition, namely around 65 % CH4 and 30 % CO2. The investigations also highlighted a quite significant but generally overlooked fact. In the upper well zone the conversion of the deposited material is well advanced with gas flowpaths leading to the surface having developed as a result of organic decomposition. These flowpaths allow air from the outside environment to enter into the gas being extracted. In the deeper layers, on the other hand, organic decomposition is still less well developed. The overlying weight tends to compact the material, the pore space is reduced and the suction pressure is insufficient to extract the gas. Leaks in the upper well zones mean that the suction pressure is reduced in these areas, with the result that there is little impact further down into the body of the dump. The THGA has developed and successfully tested a process for the renovation of leaking gas wells of this type. Here it is important that the gravel filter and inner filter pipe around it are sealed gastight over a specified distance. The inner filter pipe must then be completely free in order to ensure the functional efficiency of the gas well. In the THGA laboratory blue plastic pipes type DN 125 were set up to replicate a gas well installed in a landfill site (Figures 4, 5). 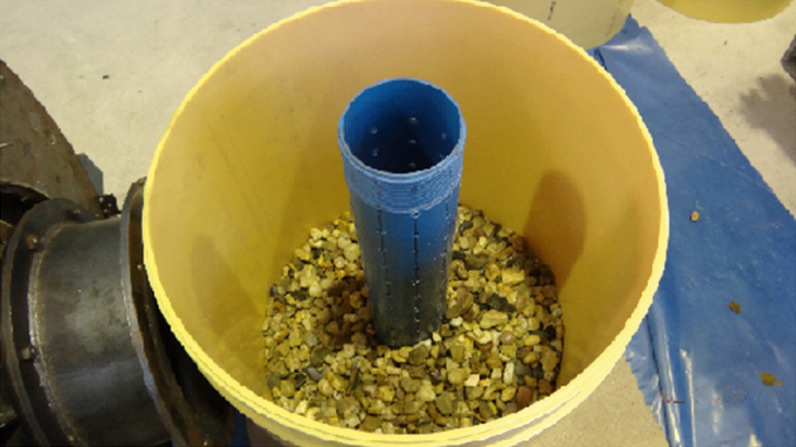 The outer structure of the test arrangement was composed of yellow DN 600 plastic pipes that were designed to simulate the walls of a well borehole in a landfill. The annulus between the two pipes was filled with filter gravel in the particle range 16/32 (Figures 4, 5, 6). 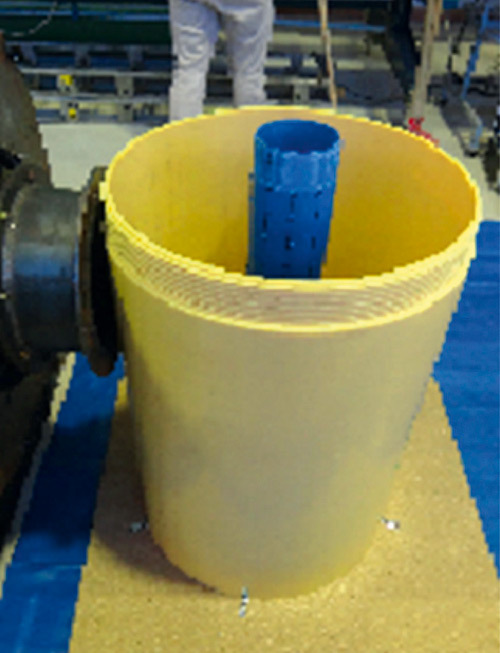 The centre section of the 3 m-high filter pipe was then blocked off above and below using polyurethane foam plugs. A special mixture of two components and a catalyst was then introduced between the two plugs. After a short period this mixture generated a foaming reaction. The foaming factor of around 17 produced a completely gastight seal around the filter gravel. When the foam had set hard the inner blue filter pipe was cut free. In order to be able to see the results of the test the outer yellow pipe was removed and any unattached gravel was cleared away. 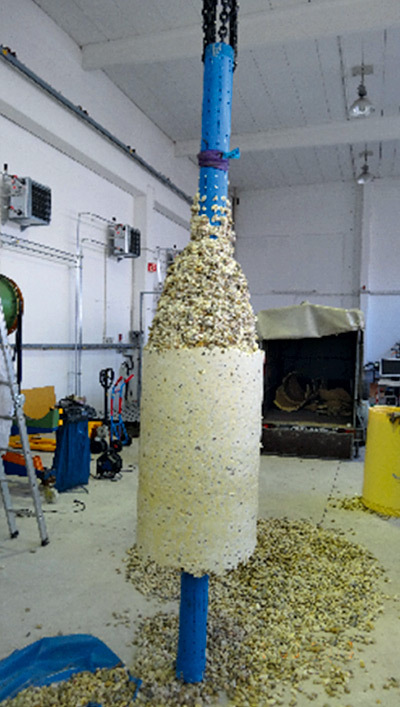 This revealed a 1 m-long plug of gravel and polyurethane (Figure 7). 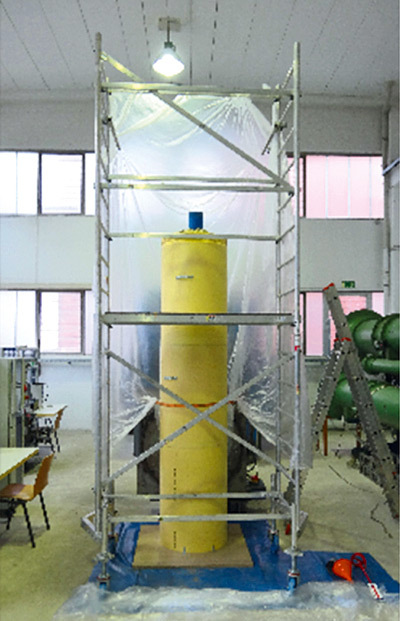 This technique has been employed to renovate gas wells not only at the Celje landfill site but also at another similar installation in Bavaria. The leaks identified by depth-zonal sampling in suction tests were successfully sealed up. Almost all gas wells repaired in this way went on to deliver oxygen-free landfill gas suitable for use in energy production plant. In both cases the generators were put back into operation. In addition to the 324 mm-diameter gas well installed at the specific waste dump investigated by the THGA there are now plans to set up a further seven wells with borehole diameters of 600 mm. To this effect a small machine container is erected at each of the eight well sites. This accommodates a side channel condenser along with measuring equipment designed to record the vacuum pressure being applied, the volume flow, the gas temperature and the gas composition. The gas obtained from the individual wells is compressed and sent by pipeline to a gas utilisation plant at the foot of the landfill. Figures 8 and 9 show the timeline for the aerobic conversion of the organic matter contained in the landfill material. The boundary between aerobic conversion (blue arrows on yellow background) and anaerobic conversion (red arrows on violet background) is plotted here as a smooth line. In reality it has to be assumed that this line takes a much more irregular course. The authors are unaware at present of any field tests that seek to investigate the dynamics of this interface. Auxiliary measurement stations are to be established around each well in order to investigate the dynamics of this interface for scientific purposes. It is planned to install 20 such stations per well. Each station will feature at least ten measurement points for temperature, vacuum pressure and gas composition at different depths. With the help of these 1,600 or so measuring points it should be possible, for the first time, to investigate the dynamics of the frontline between aerobic and anaerobic bacteria. These findings can then be used elsewhere to enable better forecasting of the productivity and operating life of gas wells, and therefore of complete gas utilisation plants. An analysis of these datasets is to be carried out as part of a joint doctoral theses at the THGA in Bochum. It is expected that each of the eight wells will in the long term provide at least 25 m3 of largely undiluted landfill gas containing more than 40 % by volume of methane. This 200 m3 of gas will then feed a gas turbine driving a generator with 400 kW of electrical output. The electricity and heat energy produced will be used locally as a way of offsetting part of the operating costs. The proposed turbine is a newly developed gas turbine system from Aurelia GmbH, Berlin/Germany and Lappeenranta/Finland. This installation boasts an electrical efficiency of ≥ 40 %. In the case of gas containing 60 % by volume of CH4 a flow rate of around 170 m3/h – and in the case of 40 % by volume CH4 a flow rate of about 200 m3/h – will be sufficient to drive the turbine at full power. About 10 to 12 % of the generated energy will be used to operate the turbine. An output of around 350 kWh at 400 V should be achievable for feeding into the grid. (1) Heyer, K.-U. ; Ritzkowski, M.; Hupe, K.; Stegmann, R.: Zukünftige Einordnung von alten Deponiestandorten: Formale Situation, Gefährdungspotenziale, Nachsorge. Deutsche Umwelthilfe e. V., 24.03.2015, Berlin. (2) Abraham, O.: Der Milliardenschatz unter alten Mülldeponien. DIE WELT, 20.09.2013. (3) Conzept Umweltberatung GmbH: Gefährdungsabschätzung – Altdeponie Blücherstraße in Bochum. Mülheim, 2011. (4) Kanitz, J.: Aerobe Stabilisierung der Kehrichtdeponie Sass Grand, Gemeinde Bever/Graubünden aus der Sicht des Verfahrensinge-nieurs. 3. ÖVA Technologieworkshop, Innsbruck 28. und 29. April 2011.